Complimentary seats of SOLIDWORKS Visualize Standard are included with SOLIDWORKS Professional or Premium Network License that is on active SOLIDWORKS Subscription Service. But in order to use them you need to reactivate your SOLIDWORKS Visualize Standard license every year. Once you activate your network license manager after purchasing your licenses, permanent licenses like SOLIDWORKS do not need reactivation until the server is upgraded or moved to a different location. However, complimentary seats of SOLIDWORKS Visualize Standard are not permanent and are based on active subscriptions, therefore they need to be renewed annually. 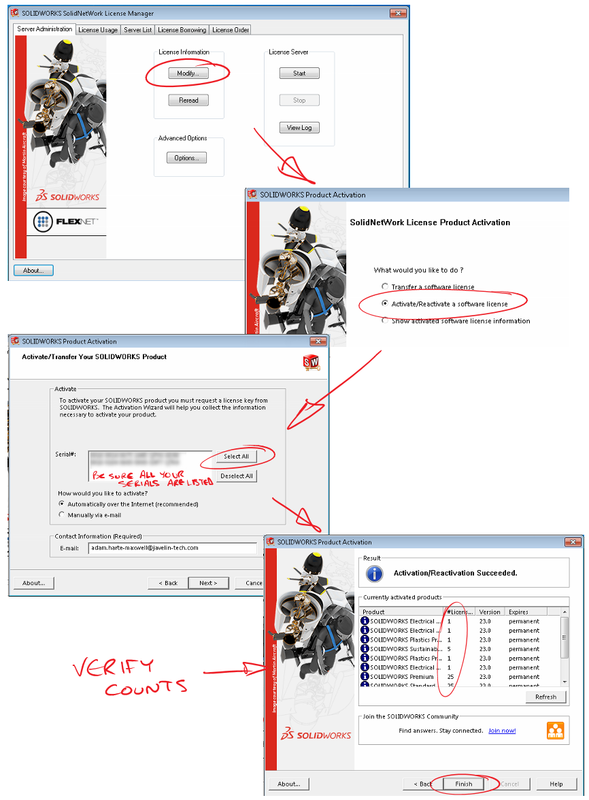 Following this process will refresh the activation information for SOLIDWORKS Visualize Standard. This process requires an active Internet connection for the SNL Manager Server software and should take only a few minutes to complete. You can also use the email activation method if there is not Internet connection available. SOLIDWORKS Subscription Software lets you do more with your CAD files! Home › SOLIDWORKS Visualize › Why am I unable to obtain a license for SOLIDWORKS Visualize Standard?